You are seriously thinking of buying property on the Placencia Peninsula?! Congratulations! There are so many things that need to fall into place before you can get to a point financially, logistically and emotionally where you can invest your time and energy in a home in Belize. As you are probably aware of by now, the Placencia Peninsula is a 20 mile long, narrow piece of paradise with the amazing Caribbean Sea on the east and the beautiful Placencia Lagoon and Maya Mountains to the west. Just like there are two sides to every story, there are two sides to the Placencia Peninsula! The Caribbean Sea is gorgeous and many people choose to make their home alongside it. But what about the other side?! As I spent time here, I began to hear from more and more people who were choosing to live on the lagoon. What makes it so special? For the six people I spoke with to write this article, the most common theme is the peacefulness and tranquility of the lagoon. With less extreme winds (moderated by the tree cover mid-peninsula) and less big development and road noise than the ocean side, residents lagoon side are able to experience the majestic beauty of this large body of water with the Maya mountains rising only 20 miles away to the west. The prevailing winds are from the east and as they hit the shoreline of the peninsula, they are moderated by the land and vegetation. The main peninsula road lies along the back side of most of the ocean front lots, resulting in more traffic noise near these homes. The road is the only transport artery down the peninsula and the transport trucks and large construction vehicles must gear up and down continually as they travel over the speed bumps that lie every kilometre or two along it. Many of the lagoon side lots are nestled in the forests of the peninsula and enjoy a more sanctuary like environment. Along with this comes greater protection from tropical storms and hurricanes. 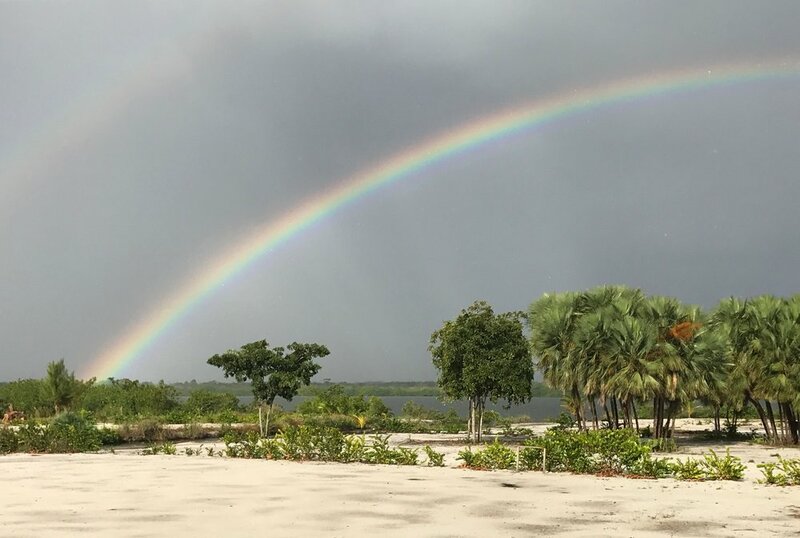 Also cherished by people living on the lagoon, is the abundance of wildlife; manatees, parrots, egrets, lizards, iguanas, fish, herons and more. There is a small crocodile population in the lagoon but everyone mentioned they are rarely seen and they never feel frightened or threatened by their presence. The fabulous mangrove ecosystem of the lagoon creates a vibrant environment for the wildlife. Everyone spoke a lot about the SUNSETS! Nici loves how every day the sunsets are lengthy, unique, often astonishing and very majestic. As the sun sets over the Maya Mountains and the clouds turn a rainbow of colours, it is a good time for a ‘happy hour’ Belizean moment! Stephanie mentioned that even if someone gave her and her husband an ocean front lot, they would still choose to live on the lagoon. 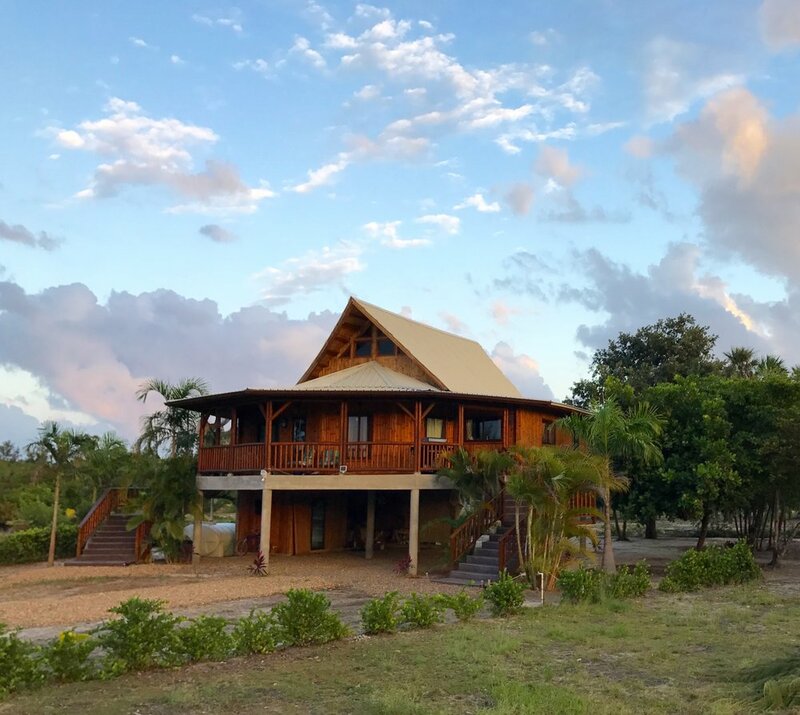 Stephanie grew up in Guatemala City and her husband is from London, England and they have found their perfect lot on the Placencia Lagoon where, after four years of living on the peninsula, they are now building their ‘dream home’. Interestingly, Stephanie mentioned that most of the peninsula realtors live on the lagoon. April loves the protection from the constant Caribbean winds on the beach side but still enjoys moderating lighter breezes at her lagoon home. She loves the ribbon of mangroves that surrounds all the canals and shorelines of the lagoon and her husband, dog and newly born daughter have a ritual of an early morning walk beside the mangroves to start their day. April feels like she has the best of both worlds where they live on the lagoon; quiet, fabulous sunsets, and privacy yet the ocean is a ten minute walk when they feel like dipping their toes in the Caribbean! A question that is often asked is are there more bugs lagoon side? The people I spoke with that have lived on both sides say ‘no’. There are actually very few bugs either side but the sunrise and sunset no-see-ums are something to protect yourself from! Maintenance! It is common knowledge that when you live by the sea, you replace your pumps, hardware, screens, AC units, fans, and anything that can rust, often! A bonus that comes with living away from the direct ocean winds is that cleaning and upkeep is much, much less! One lagoon resident estimated she replaces things a 1/4 as often as ocean side friends. If it can rust, it will rust! Julie mentioned she feels the break-ins are significantly lower on the lagoon side of the peninsula owing to the fact that properties are more hidden away in the jungle and forests of the peninsula as well as usually being smaller scale and less likely to invite intruders. Jeanne was quick to mention that she loves that everything she owns lasts longer away from the sea air and that she is more of an evening person so the fantastic sunsets are what bring her daily joy! When I posed the question to Gilles, a Landscape Architect who has worked on properties on both sides of the peninsula, he reminded me how a view with 3 different vistas is much more interesting than a view with one. When one looks out from Amik Kil Ha’, the mangrove collar around the land, and the mangrove islands across the lagoon are framed by the Maya Mountain vistas in the distance. Thus, the rule of 3! Last but certainly not least is the cost factor. Generally ocean side lots are as much as double the cost of waterfront lagoon or canal lots and this leaves money for just plain living!